Celebrities, other than being famous and talented, are usually incredibly good looking individuals. Hollywood is good at turning the average looking into stunning thanks to a large number of connections with the best stylists, doctors, nutritionists, and personal trainers. However, there are a few of these famous individuals who have us doing a double take when seen right next to a photo of a particular animal. 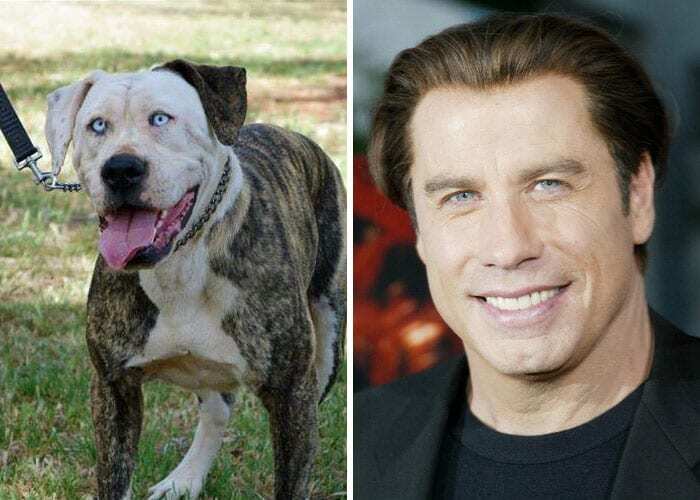 You’ll be laughing at the resemblance these stars have with these animals. Taylor is famous for his role as Jacob Black in the Twilight Saga films. 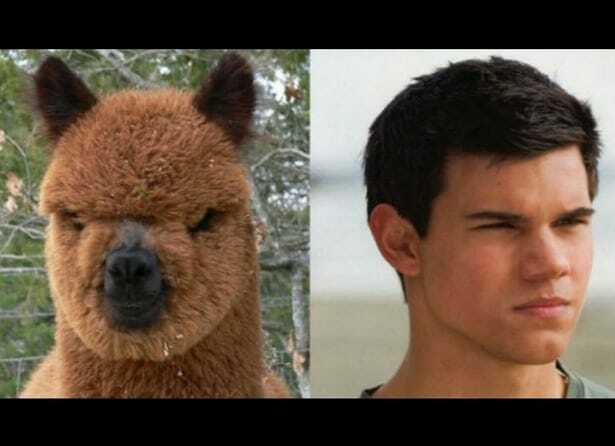 While he may have transformed into a wolf in the films (sorry for those of you that that was a spoiler) he looks much more like this adorable alpaca! The brow line is what makes these two look like they could have been separated at birth, if that kind of thing happened. Cher, known for her acting and singing is a superstar the world over. She is also famous for her use of multiple types of wigs depending on her mood and situation. 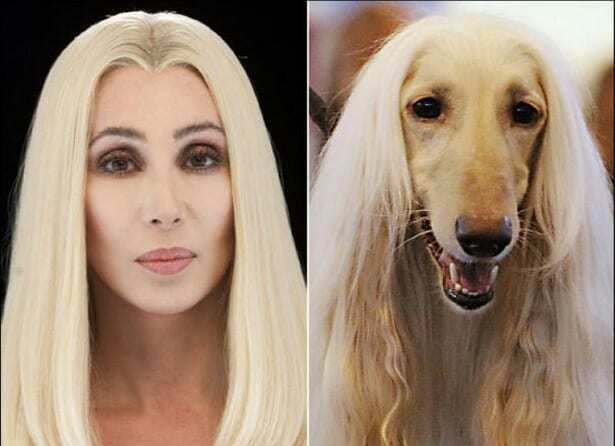 Her classic white hairstyle, the more subdued version of her many colors and hair styles is a spitting image of this Afghan Hound’s natural hair. We are not huge fans of comparing dogs and humans but they do say that humans start looking like their dogs, no? Journalist and television personality Anderson Cooper is a fan favorite on television. His outspoken and bold style of questioning has awarded him his own syndicated daytime talk show called Anderson Live. 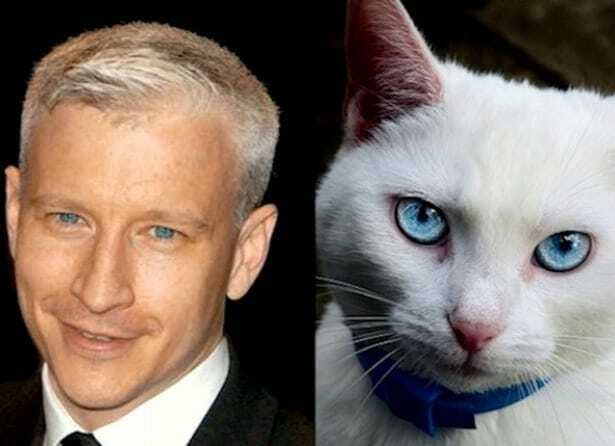 However, we are focusing on Cooper’s light blue eyes and silver hair that bares a striking resemblance to this blue-eyed light haired cat! They seem to share the same deep stare into the eyes of their opponents. Rihanna, singer and sensation-maker, has a fabulous singing voice, incredible personal style and a give-no-care attitude about whats he says to the world. Her style is what is being put to the forefront here. Her half mohawk is giving the exact attitude that this llama is trying to play off. 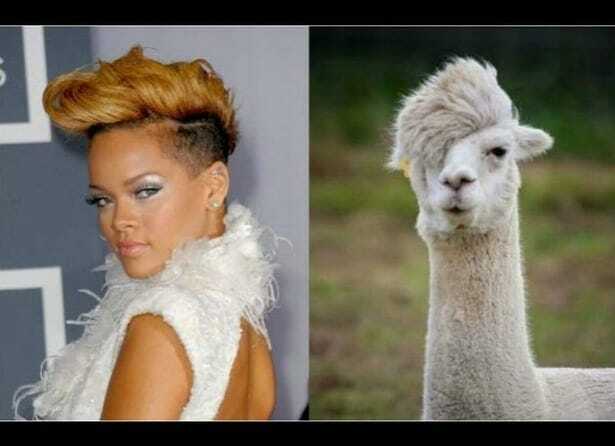 While Rihanna is making a face for the camera, a very seductive one, this llama is just wondering what the reason for the photo taking is in the first place. Ha! 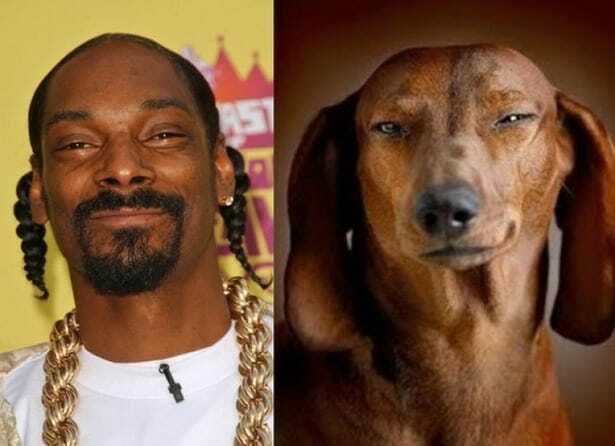 Snoop Dogg looks like this dachshund dog! It is without a doubt the squinty eyes that are the reason these two look so similar. We feel like the dog pulls it off in the cutest way for sure. We do enjoy Snoop and his endlessly funny interviews, songs, and co-hosting on Martha Stewart. Seeing Snoop bake with Martha was enough to make any of our eyes to pop. This dog seem entirely unfazed. 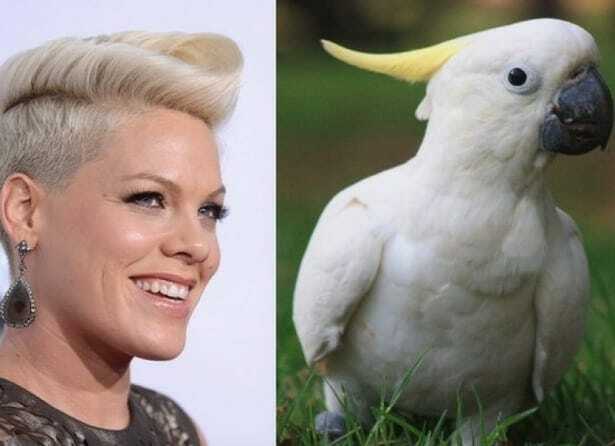 The hair color and side swoop is a clear resemblance between Pink and this cockatoo. Pink, a well known singer with hits like Lady Marmalade, Get the Party Started, and Just Like a Pill, has had a very unique personal style over the years. She has switched her hair color from dark brown, black, pink to blonde. She doesn’t seem to care for trends and does her very own thing all the time, which we love. 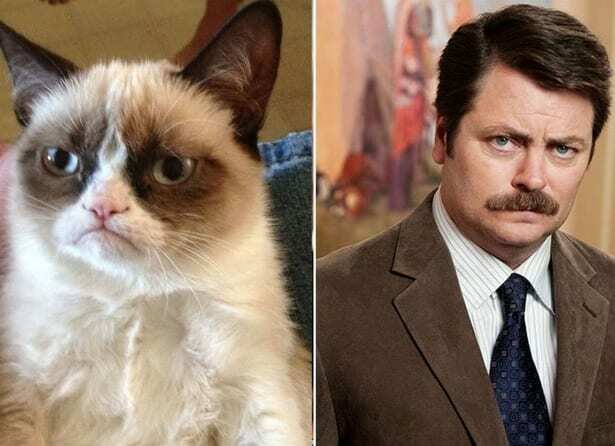 Being compared to grumpy cat is an honor! Nick Offerman, famous for his roles in Park and Recreation, Fargo, and Axe Cop, has a similar brow structure, as well as a grouchy look to him. The two should easily work together on any new project he is working on, perhaps as his long lost brother? What? It’s not that far fetched, have you seen Ted – Mark Wahlberg is brothers with a stuffed bear. Yes, we see the similarity! 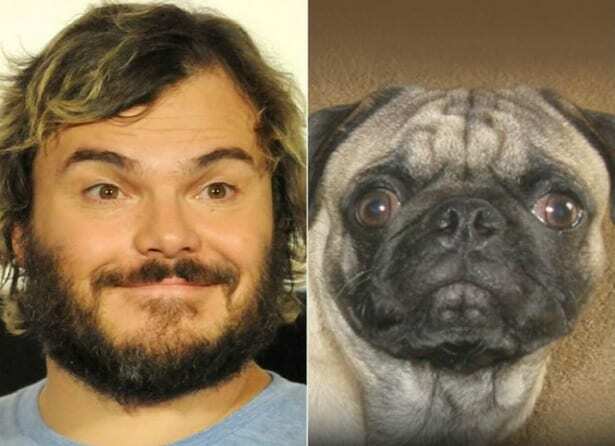 Jack Black, known for his comedic roles in The Office, Tropic Thunder, Kung Fu Panda, School of Rock and most recently the sequel to Jumanji, bares a resemblance with this adorable pug. We think it has to do with the eyes and the square face – they are similar! Black has gone into much more than acting over the years, entering the world of directing and producing as well. Well here we are looking at a similar expression and not a similarity on the daily. Sofia Vergara looks more like a goddess than an animal on a regular basis. The Modern Family star has a thing with talking in a very animated way, laughing being no exception to that situation. 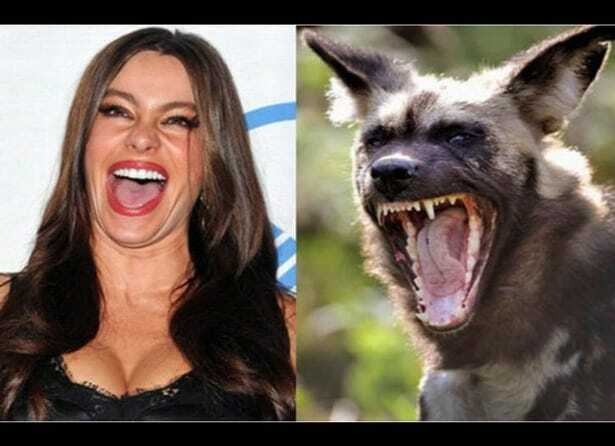 Hyenas are known for being vicious predators and Vergara has her own predator elements to her with the way she presents herself on the red carpet. Joaquin Phoenix is a devoted actor who has had starring roles in films like Her, Walk the Line, The Master, Irrational Man, and The Immigrant. He has a tendency to get very wild looking when he isn’t preparing for a role or at an award show. 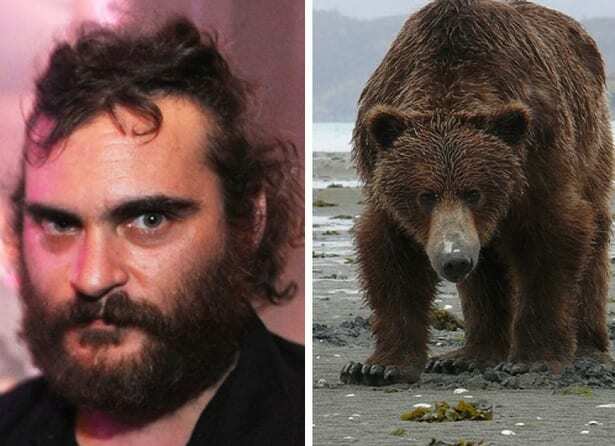 The bohemian actor likes his hair and beard grown out , transforming him to look much more like the bear we are comparing him too. George W. Bush’s expression here is exactly like this money’s! The former president of the United States has been called many things over the years, but we don’t think he’s been called monkey (or should have). 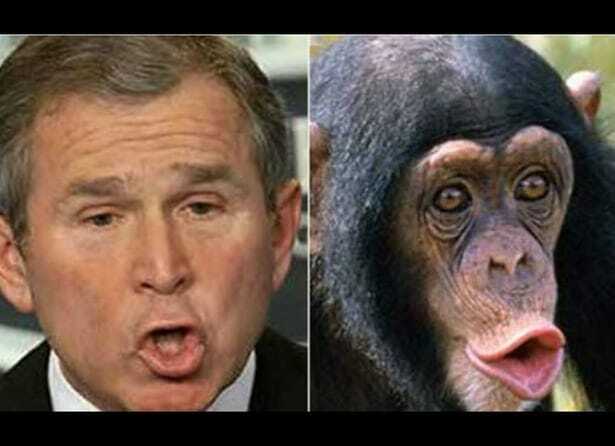 However, our comparison here is a cute one, their matching looks are an example of how we have evolved as a species – from primate to president! We can all do whatever we set our mind to. Both are posing for the camera! 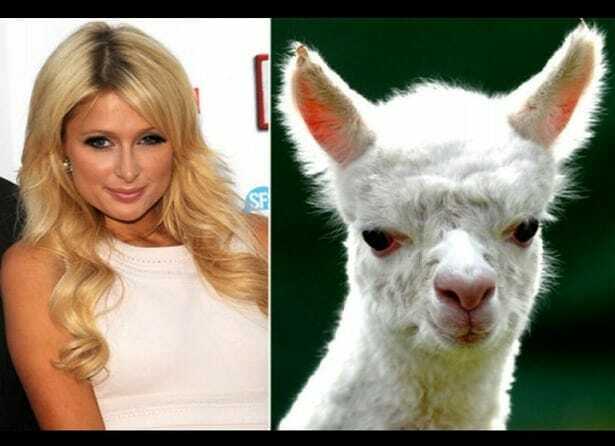 Paris Hilton, whom we all know loves the camera almost as much as she loves herself, is famous for her reality television appearances and being one of the Hilton socialite heirs. This llama has no idea who we are comparing him to but the two share a similar hair color and deep dark stare into the camera (Hilton’s is makeup, the llama’s is fur, same same). It’s the eyes and mouth, we see it! 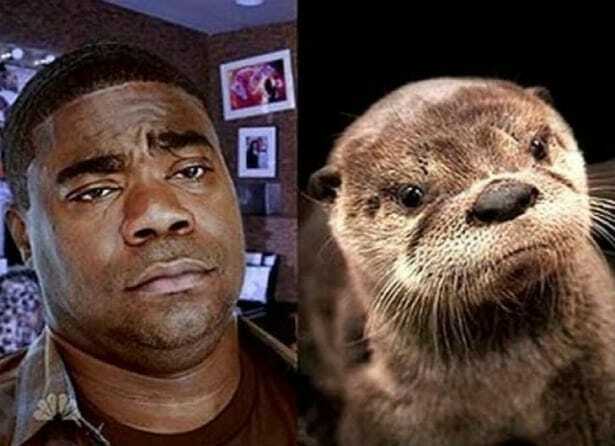 Actor and comedian Tracy Morgan, who is famous for his roles in 30 Rock, Saturday Night Live, Fist Fight, and Cop Out, bares a similarity to this adorable otter who is giving the same exact facial expression that Tracy is! Over the last couple of years Tracy has been through a very rough car accident which he has luckily bounced back from to keep making us all laugh. This is probably the nicest monkey we have ever seen. His smile seems as genuine as if he actually understood what it meant for us to see such a sight. 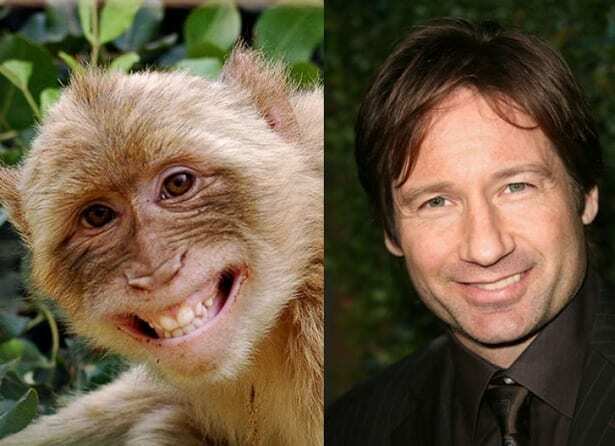 Actor David Duchovny has the same effect on us. When he smiles we are sure to swoon just like we would at the sight of the monkey. Duchovny, famous for his roles in The X-Files and Californication, does give us the same vibes here. Dreadlocks for the win! Sister Act star Whoopi Goldberg is probably one of our favorite stars in Hollywood. She’s been in hit projects like Made in America, Star Trek: The Next Generation, Ghost, Girl, Interrupted, and Glee. She can now add resembling this adorable pooch to her list of successes in her long list of career highs. 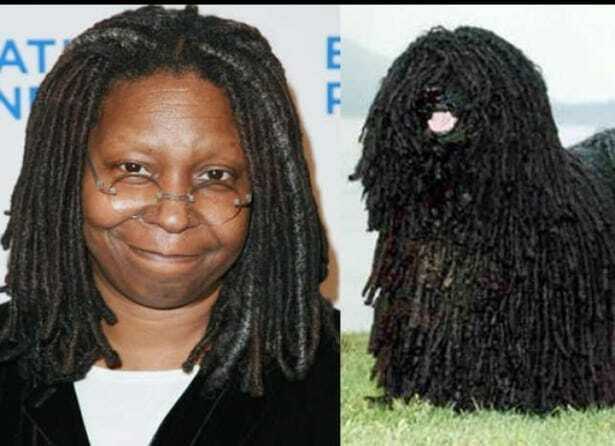 The dark dreadlocks are her signature look for sure, this little guy is such a copy cat! You may know Jamie for his hosting role on the television show MythBusters. He is also a well known special effects expert who makes the impressive on-screen effects come to life. 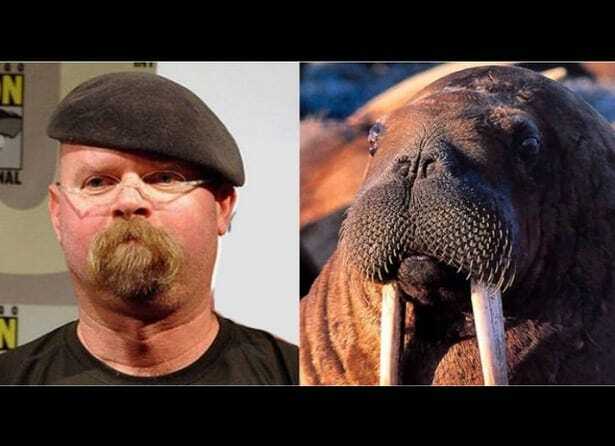 Now, the fact that we are comparing him to a walrus is NOT an insult, we love walruses! The round face and big cheeks are just too similar to ignore. His beard is even in the same zone as the walrus’ whiskers. Tina has always been a presence wherever she has gone to. She has big hair and a big voice, that’s what makes her Tina! She’s also a woman for the ages with her perseverance and strength. What’s Love Got to Do with It is still one of our all time favorite songs. 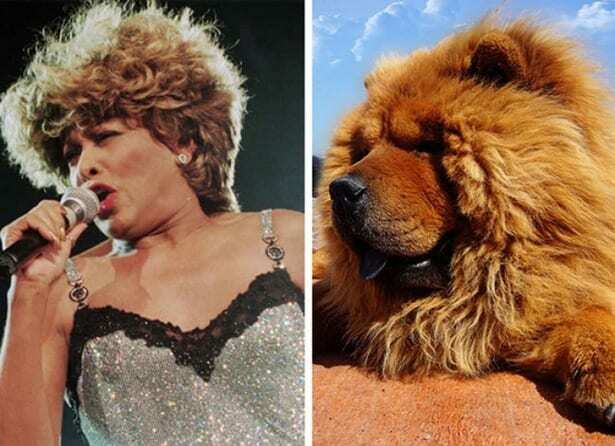 In this case we see that our dear Tina is looking a lot like this super cute chow breed, the higher the hair the closer to God? The Godfather of Punk, Iggy Pop, is one of the biggest names in music. Other than singing his heart out, he is famous for his on-stage behavior and tricks. One of his favorite things to do is perform without his shirt on. We see Iggy doing just that in the photo but now that he’s older, so is his skin. 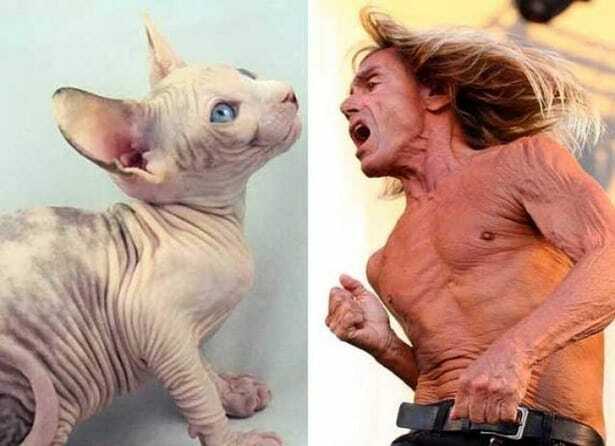 The wrinkles on Iggy remind us a whole lot of this hairless cat – just look at the duo! Any woman knows that if you don’t take your mascara off at night and end up sleeping with it, you’ll wake up with raccoon eyes, meaning your mascara would have partly come off below you eyes to give the surrounding black eye look. 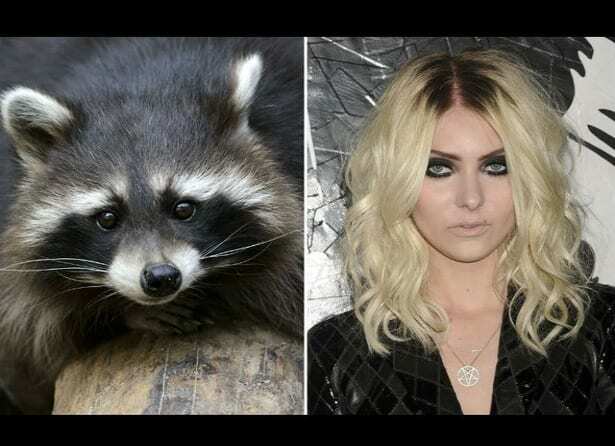 Taylor Momsen does this ON PURPOSE and hence looks so much like this adorable raccoon every day she decides to have her makeup done that way. Perhaps one of the scariest men on earth, Russian President Vladimir Putin has a stare that can make anyones blood run cold in their veins. 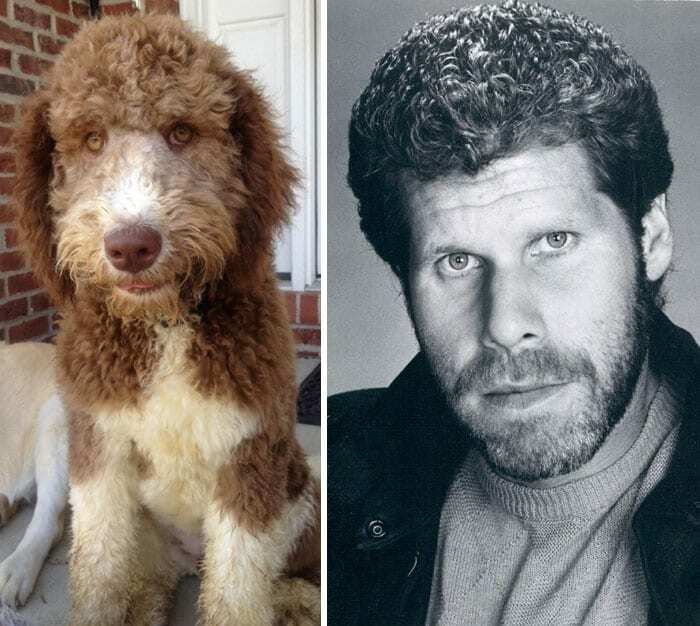 In an effort to make him seem a little less scary, we found his dog doppelgänger who is much cuter and less frightening than the president himself. 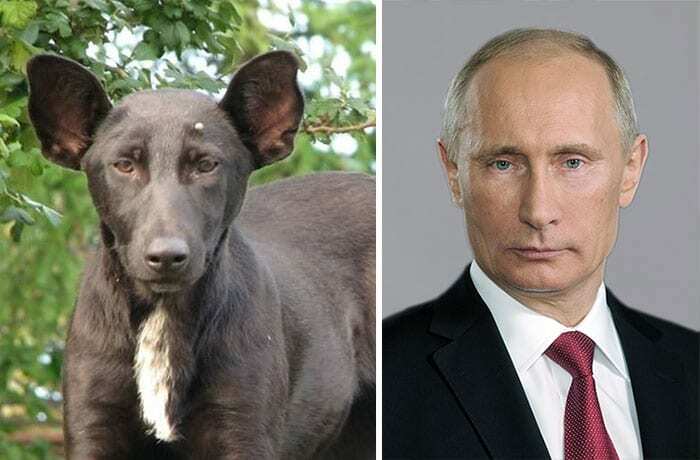 The resemblance between these two is uncanny – the stare, the jawline and the vibe of the dog works just like that of Putin’s. The unimpressed look! Samuel L. Jackson is the master of all thing s unimpressed. 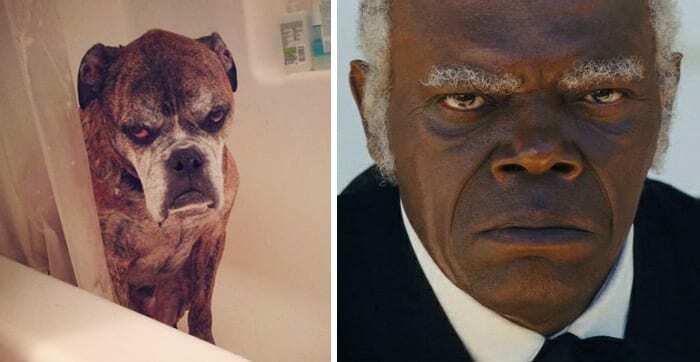 The actor, famous for his roles in Pulp Fiction, Captain America, Django Unchained, and The Legend of Tarzan, has a certain look he loves to make with his face and the dog is doing that exact look too! Although the dog has more of an excuse for it since all he does is, well, be a dog. 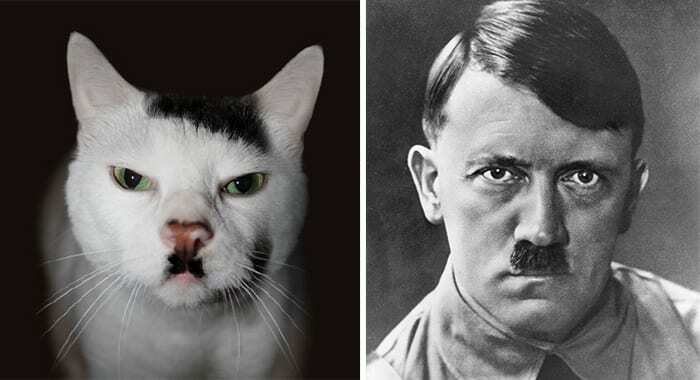 We have to say that the cat look even more evil than Adolf Hitler himself in this photo. The cat looks like Hitler thanks to the poorly placed mustache he grew as part of his fur pattern. It is most unfortunate for him and most hilarious for us! The patch of black on to of his head looks almost like a combover as well which makes it look even more like Hitler! Those pale baby blues and square face are what these two have in common. This dog is as happy as can be playing in the park and he has no idea that we are comparing him to the likes of John Travolta, who’s famous for roles in Grease, Hairspray, Face/Off, Pulp Fiction, and Ladder 49. Travolta is one of the most well-known actors in Hollywood who has had a career spanning many years. Excuse us while we disappear for hours laughing until we cry ourselves dry! 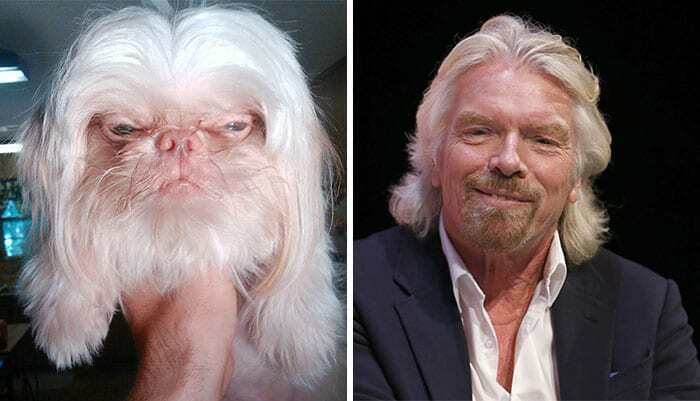 This dog looks just like Richard Branson! Not a little bit even, but looks JUST like the mogul and businessman. The founder of Virgin Group is known for many things, among them his humility, business savvy, compassion and humanitarian work. Now he gets to add the fact that he looks like this little guy too! Ron Perlman, star of films like Hellboy, Hand of God, Blade II and television show Sons of Anarchy, has been around Hollywood for decades. He is a tall guy who is never messed with and we bet that this dog, that looks just like him, is not messed with either. It’s the big round eyes and square face (for the dog it’s a square fur cut) that makes these two so similar looking. 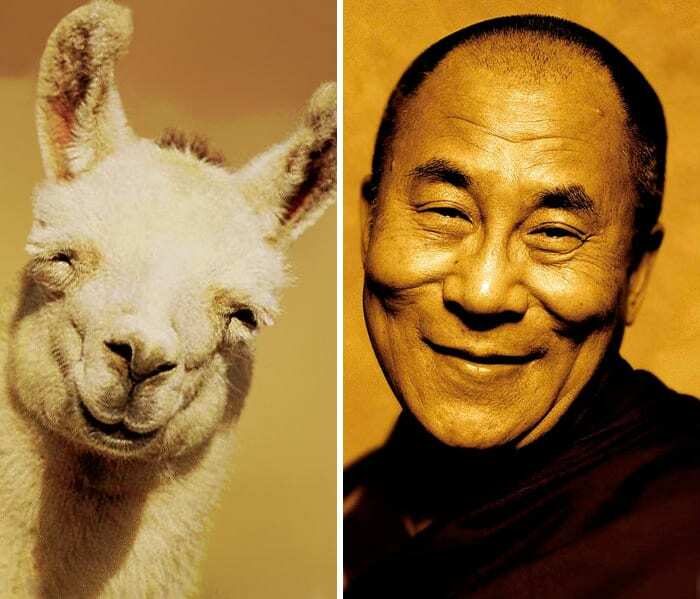 The 14th Dalai Lama looks like this llama! We did not plan this folks, we swear. When the two of them smile they look like they were made from the same cloth, no pun intended. The Dalai Lama is a monk of the Gelug school, which is the most modern schools of Tibetan Buddhism. He is the spiritual leader of the people of Tibet and we too hold him to the utmost respect, he still does look like this llama. This is what happens when your eyes are so close together, you resemble a monkey that has the same feature going on. 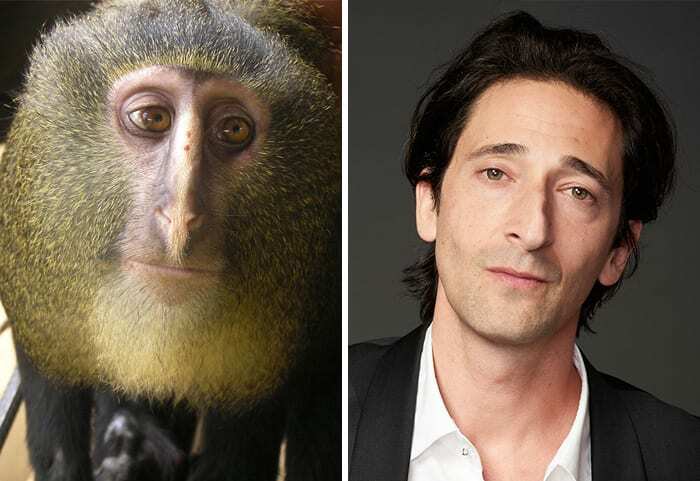 Actor Adrien Brody is looking a lot like this cute monkey thanks to the eye thing that has them looking alike. Brody is famous for his roles in King Kong, Predators, The Village, The Grand Budapest Hotel, The Pianist, and other Broadway stage productions. And now he’ll be famous for looking like this primate. Can you guess why these two look like each other? 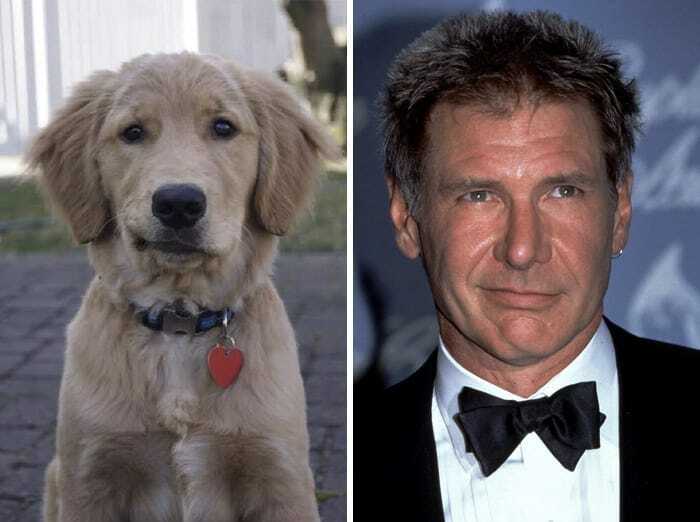 Besides the blonde hair, it’s that signature Harrison Ford lip lift! Ford has a special kind of smile that’s one sided and very cute. It is what makes him, him. The dog has the very same kind of smile and we cannot get enough of it. Harrison Ford is known for his roles as Han Solo in the Star Wars films, as well as Indiana Jones in the films by the same name. This dog has been on many memes throughout the digital world but this one has to be the best. 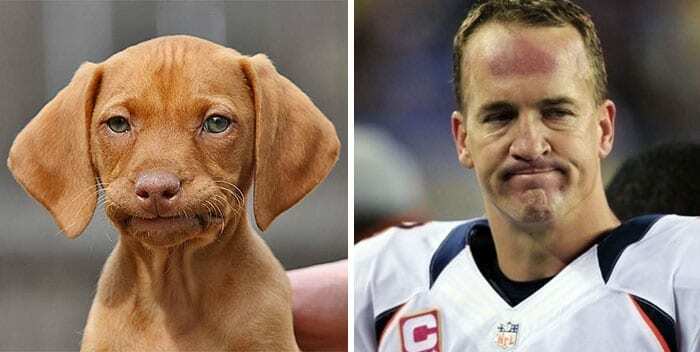 This adorable pup is making the same facial expression as quarterback Peyton Manning upon losing a game. We are trying to decide which one is making the cuter expression and leaning towards the dog since, well, he’s a dog and a puppy too! Manning will just have to get over it. Star Wars and Girls star Adam Driver has a very unique face, in the best way possible, of course. His large ears and nose that work somehow with his diamond shaped head are his signature look. 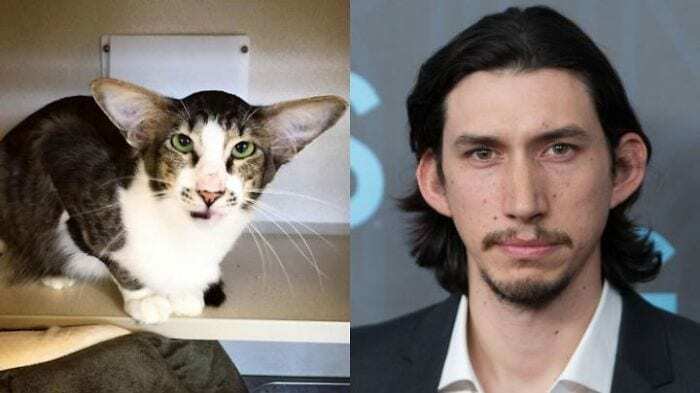 This cat has the same kind of oversized ears and nose to match! Adam should adopt this cat and the two can go everywhere together, as if people can get enough of Adam as it is! Why should you keep a dream journal?